Last weekend Mark Lotterhand and I set out to hike the entire Presidential Trail - 21 miles, crossing seven summmits, gaining 9,000 vertical feet - in one day. 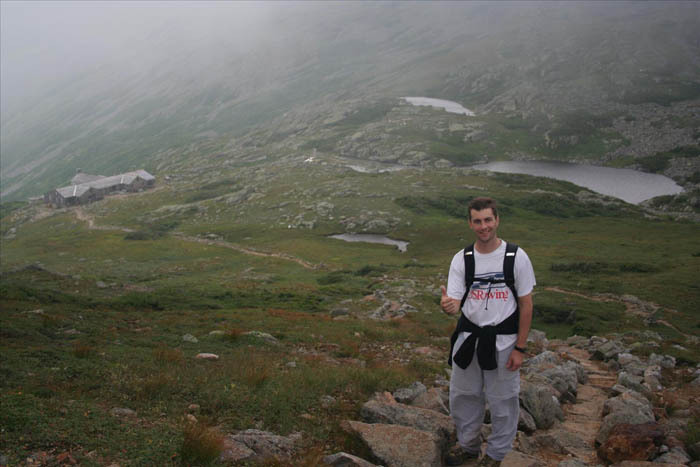 Normally this hike is done over 2-3 moderately dificult days instead of one incredibly difficult one. It's estimated there is a 60% dropout rate on this new extreme route. I may have mentioned this hike in a previous post. What I did not mention in that post was how much I was dreading this hike. I spent the week before trying to think of ways I could back out. It sounded miserable. But in the end, I couldn't back on Mark, mostly because he would hate me forever. He had already rescheduled it so I could go and he was counting on me for my car. So I went along with it and I dreaded it. Secretly I hoped that Mark's knee would give out (it had been giving him problems) and I could say, "Too bad" and our failure wouldn't be my fault. This is the first time I have ever wished injury on a friend. We started out in the dark, before the dawn. In the photo above, I am standing at the trailhead with my headlamp. It was 4:30 am and I was already wishing this trip was over. Here's a view of the Presidential Trail from the bottom, it runs along this ridge. On a clear day it gives some of the best views in all of New England. 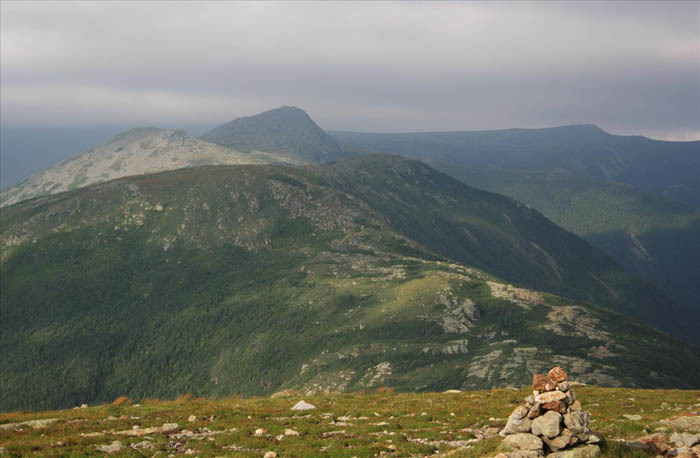 It goes over some of the tallest peaks on the east coast. 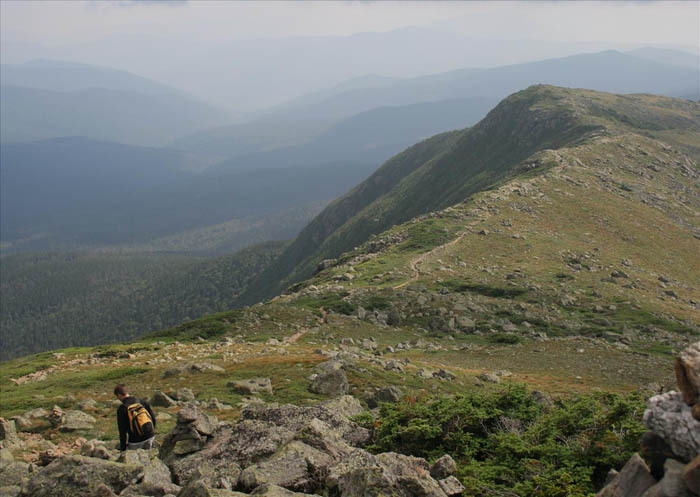 The best thing is it is almost entirely above the treeline and gives sweeping views of the surrounding countryside. And here's the view we got when we got to the top of Mount Madison, the first of seven summits. The wind was at a sustained 50 mph, with gust of 69 mph which is one mph short of a category I hurricane. It was difficult to stand. We were in a cloudbank and visibility was reduced to 10-20 feet. There was no way we could continue, at some points we were crawling. I was secretly relieved to not have to go through with the whole thing but I felt bad for Mark. He had been planning this trip for a year. We both agreed conditions made it impossible, so we would only do Mount Madison, Adams, and maybe Jefferson, then bail and find a ride back to our cars. After we spent an extended period brooding in the Madison lodge, we started out again and got a temporary reprieve. Mark snapped this photo on our way to Mount Adams before the clouds rolled in again. This one little break may have saved the entire trip. For the rest of the hike we thought, "If it happened once, maybe it could happen again." 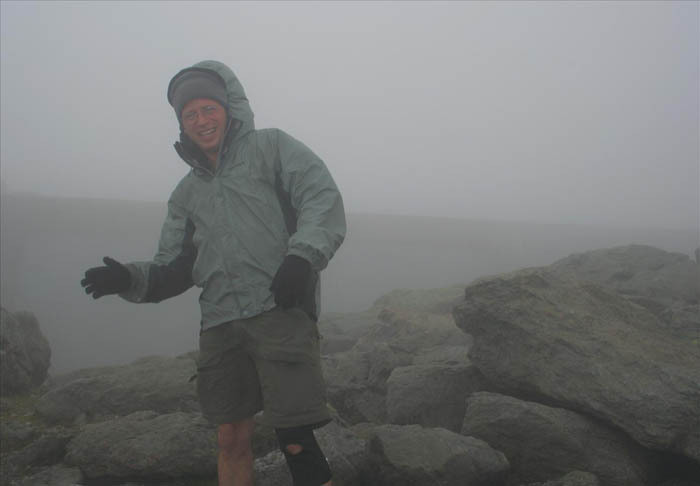 Here's Mark on the summit of Mount Adams. Strong winds yet again, no visibility. It was hard for us to comprehend how it could be 90 degrees down below. We later found out that all of New England had clear skies except for the Presidential range. At the summit of Mount Jefferson we met a couple other hikers debating what to do. We had to make a decision - keep going to Mount Washington or bail. A burst of inspiration made me say, "What the hell, let's go for it." 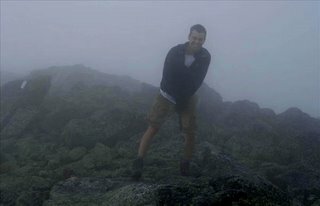 So we set out for Mount Washington, home of the worst weather in America. I'm not exaggerating when I say that. 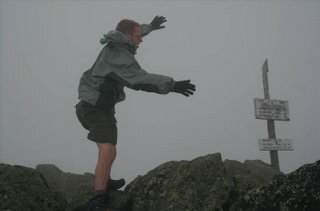 The Presidential range stands at the crossing point of three major stormfronts. The stormfronts from across the nation get amplified here, similar to the way you can put your fingers over a garden hose to shoot out a jet of water. 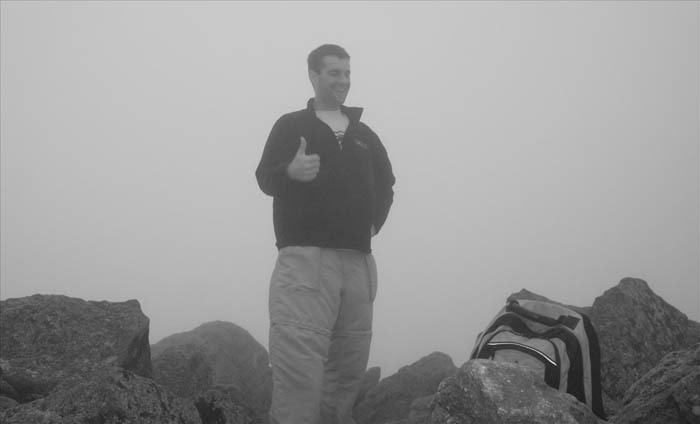 When we got to the summit of Mount Washington, I developed a bit of an attitude. There's an auto-road to the top of Mount Washington and, as a result, the summit is teeming with overweight tourists. 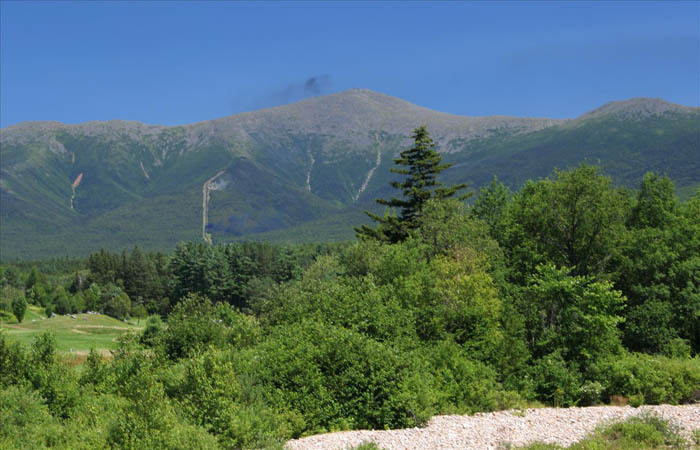 A popular bumper sticker is sold at the top reading "This car climbed Mount Washington" like it is a big accomplishment. Congratulations, car. We stopped for lunch in the cafeteria which was overflowing with people who were hungry after their arduous drive. When I asked someone if a couple of seats were available and they said no, I thought, "You don't deserve these seats." I had hiked 12 miles at this point. Like I said, attitude. Activity brings it out in me. On the way down from Washington we got briefly lost. Visibility was so poor we almost didn't realize we were backtracking down the trail we had just come up. After finding our way again, we came across some pure white rocks where we took shelter briefly. Mark's knee was in constant pain on the descents. He took Advil at regular intervals and wore a brace. But, being Mark, he never complained about it. This was behaviour very unlike myself. If I'm upset about something, you will know about it. Just ask my family, friends, and coworkers. Sometimes I'm surprised I have any friends left. 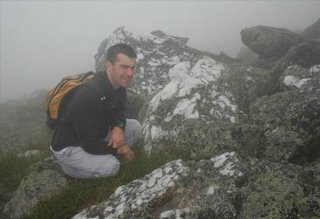 As we were climbing Mount Monroe, the fifth of the seven, the clouds finally began to break. Here we are looking over the Lake of the Clouds hut. These AMC shelters are beautiful on the inside. They feature a full-service kitchen and bunk beds, reservations are required. Coming down off Mount Monroe, we finally got some views of the surrounding countryside. You can see Mount Eisenhower in the background. This part reminded me of photos I'd seen of Scotland and Patagonia. The view from the summit of Mount Eisenhower. From here we could see the clouds which still hung over Adams, Jefferson, and Washington. Despite the view, I was starting to wish this hike was over. 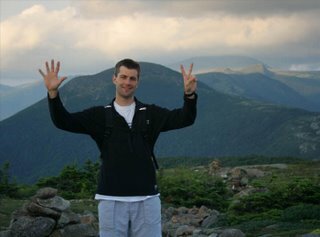 Before this hike, I would have considered a hike up Madison, Adams, and Jefferson in a single day as a long hike. Funny how your perception changes when you extend your goals to beyond what you think possible. It was only here, after 15 or so miles, that I started feeling fatigued at all. 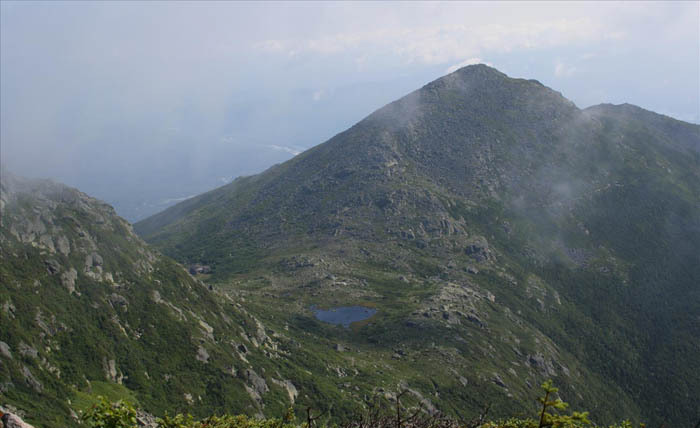 Finally we ended on Mount Pierce, named after the only president elected from New Hampshire, Franklin Pierce. One of the youngest presidents ever elected, he is also remembered as one of the worst. He was also a raging alcoholic. Just some fun facts for you. The hike down from this point was below treeline and, as it always is with hiking, it went on a little longer than I thought possible. Just when I think I can't take any more, the hike always seems to go another 30 minutes beyond that point. As an added plus, when we finally hit the road, we had to walk another mile to where the car was parked. 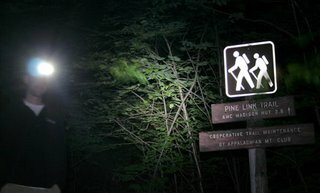 We finished the hike at nine o'clock at night, so we started in the dark and ended in the dark. We probably could have gone a little faster but we didn't want Mark's knee to blow out which, despite my earlier wishes, would have been catastrophic. I slept like the dead that night at the hotel. Thanks for reading! If you have any questions about this hike, please leave a message in the comments. Hiking-related posts: hiking Mount Passaconaway, why I climb, and climbing Mount Kilimanjaro. Mozza - thank you very much! 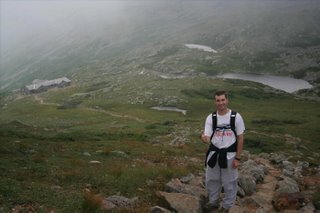 I'm considering doing a marathon or a half-marathon after completing this hike. You want to do a marathon? Try having kids and then taking care of them every day. That's a marathon. You hiked seven peaks in one day? Raising kids is like hiking seventy peaks in one hour. Anonymous - Oy, no thanks. That sounds like a nightmare. What an amazing hike. All the presidents would be proud. You could combine the two -- hills and marathon -- and do the San Francisco marathon? I have kids and have hiked 32 of NH's 4000 footers. NH peaks give the kids a good run for their money. Especially a power hike like yours....beats my 18 miler...Grats! Its Amazing and congratulations for the hike. We can hike it, but its difficult for one day. nice collections and pictures yo got from the trail. I think you can try out more than this. It will increase your ability and efficiency and also the hiking interest. Impressive... Congrats! Not only for the climb but also for narrating it so well! Enjoyed it!